The academic blogger who goes by the slightly pretentious name of … andthentheresPhysics is a dogged character who never concedes any point. When you think you have him pinned down, he wriggles out and insists on having the last word. I can’t understand how he has the time, both on his blog and on twitter simultaneously! It is a mystery. Anyway here is an example on his recent blog post on ‘Lukewarism’, which starts as follows. We can’t measure Climate Sensitivity but we can measure CO2 levels in the atmosphere. It is a mistake to set goals based on temperature rise rather than on CO2 levels. Instead of the Paris agreement limiting temperature rise to 2C, it should have limited CO2 levels to say 500ppm. That way there is a defined goal rather than a hypothetical goal which cannot be measured. Climate sensitivity (ECS) is not a fundamental constant anyway, since it must vary with time and with temperature. It is a mistake to set goals based on temperature rise rather than on CO2 levels. Instead of the Paris agreement limiting temperature rise to 2C, it should have limited CO2 levels to say 500ppm. I don’t think there is really much of a difference. A temperature target and a CO2 level target will both be associated with carbon budgets (i.e., how much more we can emit). CO2 levels were probably higher because the earth was warmer and not the other way round. Huh? Without CO2 in the atmosphere, the Earth would probably be a snowball. It’s probably correct that the drawdown of CO2 has lead to a long-term cooling, but that does not mean that you can’t use past CO2 levels and global temperatures to say something about climate sensitivity today. Also, the Pliocene was only a few million years ago, so I don’t think the arrangement of the continents was all that different to today. What came first the egg or the hen? 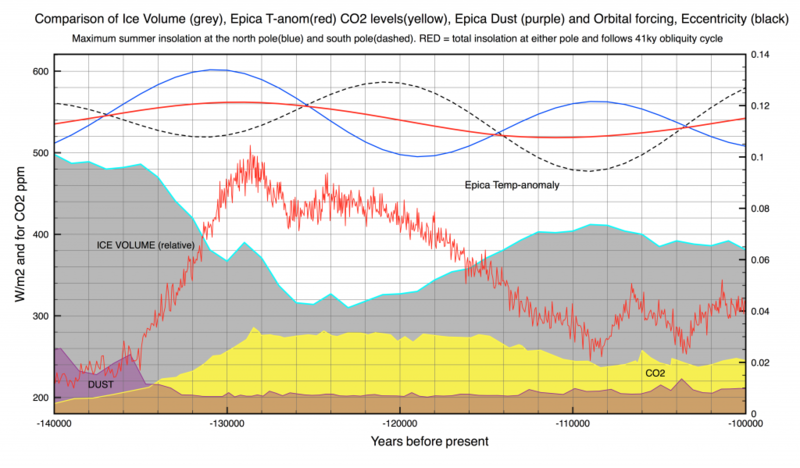 Yes CO2 is a greenhouse gas but we know that during Ice Ages levels falls below 200ppm. CO2 does not cause ice ages, which are forced by Orbital changes. However, CO2 may accentuate them. Likewise CO2 did not cause the cooling of the Earth over the last 5 million years, but its decrease may have accentuated it. The Geological weathering thermostat seems to set long term CO2 levels for any epoch. What we don’t understand is exactly what sets the thermostat temperature. The position of the continents and ocean circulation must be a strong effect. The closing of the Panama Isthmus cut off the Atlantic from the Pacific about 3 million years ago and this is a possible cause. What is occurring today is completely different. Humans are artificially increasing CO2. This has only happened once before at PETM 56 Million years ago when the world was much warmer and natural CO2 levels were near 1000ppm. The pulse of CO2 then was more than if we were to burn all known fossil fuel reserves. DT was ~5C. This is the only example where we could try to measure ‘anthropogenic’ climate sensitivity. Again, huh? If we know there was a period in the past when the continents were in a similar configuration to today and the atmospheric CO2 was ~ 400 ppm, then we can use information from that period to infer what might happen now if atmospheric CO2 concentrations remain at ~ 400ppm. It doesn’t really matter what caused atmospheric CO2 to be ~ 400ppm. What is occurring today is completely different. The cause of the change in atmospheric CO2 might be different, but the effect is not likely to be very different. No @ATTP you are making a false conclusion which goes to the heart of the problem. You reject that 3 million years ago the natural value of T was instead 290C so then CO2=400ppm. However this must have been the case since unless you can find natural source for increasing CO2, the geological thermostat would have pumped out any excess CO2 within a thousand years. It is obvious that the GAIA (geology + life) set temperature of earth varies with time. Life itself starts to falter if CO2 levels fall significantly below 200ppm at which point the deep ocean sink starts to fail, restoring temperatures conducive to life. Can I maybe ask that you refrain from telling me what I assume and reject? If I want people to know what I assume and reject, then I’ll tell them. All I’m suggesting is that all else being equal, a 400ppm world in the past should have a similar equilibrium climate state to a 400ppm world today. I don’t think this is all that controverisial a point. Of course, if the solar forcing is different, or the arrangement of the continents is different, then the states may differ. If, however, the solar forcing is similar, and the distribution of the continents is similar, then we can use a 400ppm world in the past, to infer what such a world would be like today. CO2 is not the only show in town. The Northern Hemisphere is more problematic. From sediment cores and other data, we know that until about 5 million years ago, North and South America were not connected. A huge gap—the Central American Seaway—allowed tropical water to flow between the Atlantic and Pacific Oceans. A growing body of evidence suggests that the formation of the Isthmus of Panama partitioned the Atlantic and Pacific Oceans and fundamentally changed global ocean circulation. The closing of the Central American Seaway initially may have warmed Earth’s climate, but then set the stage for glaciation in the Northern Hemisphere at 2.7 million years ago. I didn’t say it was the only show in town. Strawman much? I have a funny feeling that Clive is arguing that geological processes can act to draw down (or release) CO2 so as to cool, or warm, the climate. Well, yes, but this tends to take a long time (thousands of years) and doesn’t change that, all else being equal, a 400ppm world in the past can be used to inform what we might expect for a 400ppm world today. Thanks for the explanation. If I understand you correctly you are implying that CO2 is the only determinate of global temperatures. Past warmer climates were due to more vulcanism increasing the natural CO2 levels. So the climate has entered a critical stage in the Pliocene whereby Milankovitch cycles alone were able to trigger glaciations, whereas before then higher CO2 levels avoided this. A three-degree rise would spell the collapse of the Amazon rainforest, disappearance of Greenland’s ice sheet, and the creation of deserts across the Midwestern United States and southern Africa. A six-degree increase would eliminate most life on Earth, including much of humanity. Don’t forget that most of North America and Northern Europe were under 3km of Ice just 20,000 years ago. Somehow humans and other life managed to adapt and survive. Quite possibly we have inadvertently delayed the next glacial cycle because obliquity is reducing following the Holocene optimum. Don’t forget that most of North America and Northern Europe were under 3km of Ice just 20,000 years ago. Somehow humans and other life managed to adapt and survive. So, 20000 years ago, the ~7 billion people on the planet, a significant fraction of whom had moved into cities and urban regions, and who relied on a complex infrastructure that provided food, shelter, entertainment, etc, managed to adapt easily to the arrival of 3km ice sheets across most of North America and Northern Europe……oh, hold on?????? No but that is exactly what 9 billion people will have to do when another ice age begins. In 5000 years time people may even be grateful we kept CO2 levels at around 400ppm ! Well, an issue is that if we continue as we are, it’s not going to be at around ~400ppm, it will be considerably higher. Also, we might benefit from not using up all the available fossil fuels now, just in case there is some need to maintain CO2 levels at 350 – 400ppm. I more or less agree this time. However surely it is a good thing if we can delay the next ice age altogether? Of course I meant Pleistocene not Pliocene ! I doubt this is actually possible; in the sense that there will almost certainly be another ice age at some point in the future. I find it slightly odd that you seem comfortable being rather alarmed about an ice age that we’ve almost certainly delayed by thousands of years, while completely blase about possibly changing the climate by a magnitude that is higher, and a rate that is faster, than at any time in human history. at which point I more or less gave up as it is like playing ping pong. He is very entertaining, but very trying with it. I applaud you for keeping at him for so long! I am cross-posting from ATTP here since Willard is redacting my comments. Anders posts: Is there a realistic scenario under which we can continue to pump CO2 into the atmosphere without producing impacts that are severely damaging? Global catastrophic initiation of glacial cycle is a real threat. Carl Sagan was the first to sound that alarm by coining the term “nuclear winter” as an enhanced destructive result from a moderate nuclear exchange. The “Day after Tomorrow” highlights the same threat should there be a cessation of the AMOC. So, having a little CO2 cushion, whatever degree of warming it provides, may be a savior just as its fertilization effects may have been to stave off 50-years ago predicted global famine by this point. Willard is a pest. He seems to be ATTP’s gate-master to ensure that any contrary views, no matter how well argued, get trashed. Everything is a question of balance, which climate ‘fundamentalists’ however dismiss as ‘lukewarmism’. Thank you for the kind words, Clive. A more plausible explanation than your self-serving one is that your peddling gets a bit boring after a while. Have you ever considered making your claim(s) explicit? Hard to make sense of what you call your “arguments” otherwise. It wasn’t that. It was because ATTP could not explain why the Eemian was warmer than the Holocene, yet CO2 levels were the same. So he deleted it. He is welcome to respond here if he has now found a reason. Thank you for knowing the reasons why I moderated your comments, Clive. – counter anything said so far. In other words, dear Clive, rope-a-doping from “what about X” and “what about Y” and “what about Z” impose on otters commitments you don’t yourself make. Worse side-effects of “what about” peddling include reversing the burden of proof, moving the goalposts, and burning down a strawman. And that’s besides being barely irrelevant to the main topic of the thread, which was about luckwarming, which you don’t even endorse completely. As far as I am concerned, your accusation that your argument has been deleted has little merit,for the simple reason that you haven’t made any. Arguments are claims. What’s yours? Cliver, there was one climate variable that I feel you and Anders neglected: topography. The Pliocene saw the broken Pangea continents coming back to collide creating uplift and greater variance in elevation relative to sea level. The Quaternary Ice Age may have been brought on by a combination of factors, including more white-tops (reflective surface) causing higher albedo. Of course, I agree that rock weathering could have raised the PH of the oceans, to help draw down CO2 along with the cold shifted (increased) solubility. And, just as the greater elevation variances helped lead to the Ice age the glaciations further exaggerated the effect by lowering sea level and raising elevations with glacial ice, creating a strong positive feedback. I don’t know if Hansen and Sato figure that in when using paleo-climate extrapolations of ECS. I agree topography is very important in determining climate. The uplifting of the Himalayas and the Tibet has cooled the planet for the simple reason that a vast surface area is now much cooler due to the lapse rate. The greenhouse effect is due directly to the fall in temperature from the surface to the effective emission height. If you raise the surface in one part of the earth it reduces the local greenhouse effect. Amazing discussion. Science seems to agree that warm ground can warm the air which rises and cools. Science never explains where the energy went. Okay, they do mention the dry adiabatic lapse rate. Indeed, that tells us CO2 molecules in the atmosphere will also be at a temperature appropriate to the altitude. Conduction between gasses yes/no? CO2 is a radiative gas. It is also quite heavy. If it ever got cold enough up in the atmosphere to absorb any 15um radiation from the surface it would have long fallen out of the atmosphere. For over 10 years now I have been looking for an explanation for how a radiative gas can ‘trap heat’. Heat is transported from the surface through convection and latent heat (evaporation). On balance heat flows via Hadley type convection cells from the tropics to high latitudes. Heat escapes to space by IR radiation from H2O, CO2, O3 etc. These radiate at the local temperature. The atmosphere is one big heat engine powered by the sun. Weather is the consequence. The idea that back radiation heats the surface is mostly nonsense. Here is what one of the world’s most respective experts (Ray Pierrehumbert) had to say to correct ATTP. The surface energy budget is mostly a sideshow. For the most part, the surface budget (which consists of radiation plus turbulent latent heat and sensible heat transfers) just acts to drag the surface temperature along with the low-level air temperature. Even so far as the downwelling IR goes, the main reason for the increase of downwelling IR is the increase of lower tropospheric temperature (mandated by combination of convection and top-of-atmosphere budget), not the direct effect of increased low-level opacity due to CO2. As the planet warms you do get a significant boost in lower level opacity from increasing boundary layer water vapor, but given that in most places the surface temperature is already close to the low level air temperature, this is not a major player, especially not over the oceans. Yes that is an excellent article by Clive James. I have stopped calling them Climate Alarmists. Really they are Climate Fundamentalists. I was about to comment that it was more like a theological argument than a scientific exchange, but you have just gone and nailed it right there. You might as well try to engage a creationist about the origins of man – he would throw in some scientific factoids where it suited, but never have an open minded discussion. I have not gone into the subject as much as you have, or with as much accomplishment. I am an amateur taking an interest in science again in my retirement. However, I do know a lot about risk management and the extent to which decisions in real life are partly guided by research, but also partly by judgement. There are no facts about the future, only extrapolations, though some things can be predicted more accurately than others. Pseudo scientists (and I include economists in that category) think that scientific method is about certainties predicted by experts. Real scientists know when they are at the limits. I think climate science is in its infancy, and we need to be careful about the policy decisions we make on the back of it. I believe the precautionary principle is a totally flawed concept as well, and not a reason in itself to adopt near term policies which we know to be (very) harmful. So, that’s how I come to be lukewarmist. I am more impressed by fellow lukewarmists, e.g. Mat Ridley, than by the output of alarmists, not least because they seem more balanced in their views. I have a PierreHumbert text book in my bookcase – but I need to complete my undergraduate course (again) before I get to that! It seems that, driven by the need to continually support the Catastrophic Anthropogenic Global Warming thesis climate scientists are examining the temperature record at altogether too fine a scale, month by month, year by year. Our current, warm, congenial Holocene interglacial has been the enabler of mankind’s civilisation for the last 10,000 years, spanning from mankind’s earliest farming to recent technology. Viewing the Holocene interglacial at a broader scale is much more fruitful, on a century by century and even on a millennial perspective. According to ice core records, the last millennium 1000AD – 2000AD has been the coldest millennium of our current Holocene interglacial. For its first 7-8000 years the early Holocene, including its high point known as the “climate optimum”, have had virtually flat temperatures, an average drop of only ~0.007 °C per millennium. But the more recent Holocene, since a “tipping point” at around 1000BC, 3000 years ago, has seen temperature fall at about 20 times that earlier rate at about 0.14 °C per millennium . The Holocene interglacial is already 10 – 11,000 years old and judging from the length of previous interglacial periods, the Holocene epoch should be drawing to its close: in this century, the next century or this millennium. But the slight beneficial warming at the end of the 20th century to the Modern high point has been transmuted into the “Great Man-made Global Warming Scare”. As global temperatures have already been showing stagnation or cooling over the last nineteen years or more, the world should now fear the real and detrimental effects of cooling, rather than being hysterical about limited, beneficial or probably now non-existent further warming. Warmer times are times of success and prosperity both for man-kind and the biosphere. For example during the Roman warm period the climate was warmer and wetter so that the Northern Sahara was the breadbasket of the Roman empire . According to the Ice Core records, each of these successive Holocene warm periods have been cooler than the one previously and a tipping point towards accelerated global cooling occurred at about 1000BC. The coming end of the present Holocene interglacial will in due course again result in a mile high ice sheet over much of the Northern hemisphere. As the Holocene epoch is already about 11,000 years old, the reversion to a true ice age is almost overdue and would be the real climate catastrophe. With the present reducing Solar activity, significantly reduced temperatures, at least to the level of another Little Ice Age are predicted quite soon later this century. Put it this way Ed. With population growing fast while simultaneously there is a rapid reduction in world poverty, it is hard to argue there have been adverse effects from a 0.8C rise in temperature. The population is indeed growing fast. Might this be a driver? Quite unbelievable shenanigans at ATTP! I pointed out that Antarctic Ice Core data show convincingly that Eemian interglacial temperatures 125K year ago were > 2C warmer than today, yet measured CO2 levels remained at 280ppm. No answer – so ‘Willard’ simply redacted my post ! I wonder if he perhaps is an alter ego of ATTP? He banned me from his blog and blocked me on twitter when I pointed out that he didn’t seem to know what a boundary condition was. Never admit anything seems tp be the rule, and if caught out, delete, block, change the subject, whine about civility, or tell people to f*** off (without the *s). He also has some gatekeepers like “willard” to sanitise the record. I am dumbfounded because this is basically the antithesis of science. They deleted my whole argument! Either you restore my original posts as they were originally or I will have to complain to WordPress. Wow, what a bizarre comment. Feel free to complain to WordPress. I really don’t think they have any say whatsoever in how I chose to moderate this blog, but maybe I’m wrong. Noone else has ever suggested that they would complain to WordPress. What I will say, is that if you don’t like the moderation policy, you are free to not comment here. On the other hand, I still don’t really have a clue as to what you are getting at, so if you wanted to go ahead and state the point you’re trying to make, that would be fine too. You intentionally deleted a reasonable comment which pointed out that the Eemian interglacial was 2C greater than today while CO2 levels remained at 280ppm. In my opinion that violates WordPress open debate rules. Re Best v ATTP/Willard: Please pass the popcorn. ? Seriously, move on, or go away. Complain to WordPress, if you wish. I’ve got much better things to do than pretend I’m back school. My moderation policy also includes not complaining about moderation. So, either state the point you’re trying to make, or feel free to comment elsewhere. I don’t really mind either way. Please simply restore it immediately and any follow up comments. I am perfectly happy to argue my position – but are you ? Please restore it immediately and any follow up comments. I am perfectly happy to argue my position – but are you ? I don’t really have a position to argue. I was more having a discussion. Maybe you should consider doing the latter, rather than the former. If your next comment isn’t you stating the point you’re trying to make, I will simply delete it. I don’t mind that my follow-up comment to Clive was removed. ATTP’s blog, his rules. you need to present your arguments in a more succinct clear fashion. At present they’re rambling and don’t seem to really relate to what people are discussing. I used the example of the Eemian to prove that it is not always the case that CO2 levels and temperature are correlated. ATTP could not answer – so he deleted it. Or maybe it was too boring. So was his argument about mid-Pliocene? I *did* answer it, but got deleted as well – because your original comment had been deleted while I was replying to it. The answer is fairly straightforward: orbital dynamics are different for each interglacial. Interglacials are triggered by increases in summer insolation at high N latitude. Summer NH high latitude insolation was greater during the Eemian than the Holocene. This had a stronger influence on albedo feedback in the high N latitudes (snow/ice -> tundra/grass -> forest; albedo down all the way). So while the global CO2 feedback response was roughly equivalent to the Holocene, NH albedo played a larger role in setting global average temperature than during the Holocene. Hence higher GAT during the Eemian but roughly the same CO2 ppmv. In response to Nathan Tetlaw’s point that SkS covered this point years ago, in reading that post I find the arguments puzzling. Obviously if orbital influence and albedo are such dominant factors it leaves less room for CO2, or need for it to provide explanation of variations. OTOH, I suppose the alarmist argument is that we have the potential to have Eemian highs added to the CO2 warming. But the SkS post puts emphasis on orbital effect of which we are in cooling mode now. The larger point that climate is highly variable regardless of CO2 means that the answer is geoengineering to modulate climate and general hardening rather than focusing only on CO2. Here is a detail showing how CO2 levels remained high even while the world slipped into another glaciation. It is kind of saying that only when NH Boreal Forests and vegetation died out did CO2 reduce significantly.